ICC/IF: HeLa and T47D cells. Flow Cyt: T47D cells. Our Abpromise guarantee covers the use of ab185048 in the following tested applications. ab185048 staining Cytokeratin 7 in T47D cells. The cells were fixed with 4% formaldehyde (10 min), permeabilised in 0.1% Triton X-100 for 5 minutes and then blocked in 1% BSA/10% normal goat serum/0.3M glycine in 0.1%PBS-Tween for 1h. The cells were then incubated with ab185048 at 1/100 dilution (shown in green) and ab195889, Mouse monoclonal [DM1A] to alpha Tubulin (Alexa Fluor® 594, shown in red) at 2µg/ml overnight at +4°C. Nuclear DNA was labelled in blue with DAPI. This product gave a positive signal in 100% methanol (5 min) fixed A549 cells under the same testing conditions. ab185048 staining Cytokeratin 7 in HeLa cells. The cells were fixed with 4% PFA (10min) and then blocked in 1% BSA/10% normal goat serum/0.3M glycine in 0.1%PBS-Tween for 1h. The cells were then incubated with ab185048 at 1/50 dilution overnight at +4°C (shown in green). AlexaFluor®350 WGA was used at a 1/200 dilution and incubated for 1h with the cells, to label plasma membranes (shown in blue). Nuclear DNA was labelled in red with 1.25 μM DRAQ5™ (ab108410). Overlay histogram showing T47D cells stained with ab185048 (red line). The cells were fixed with 4% formaldehyde (10 min) and then permeabilized with 0.1% PBS-Tween for 20 min. The cells were then incubated in 1x PBS / 10% normal goat serum / 0.3M glycine to block non-specific protein-protein interactions followed by the antibody (ab185048, 1/500 dilution) for 30 min at 22°C. 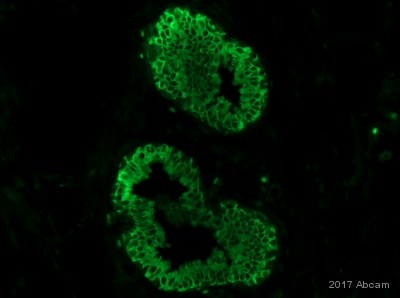 Isotype control antibody (black line) was rabbit IgG (monoclonal) Alexa Fluor® 488 used at the same concentration and conditions as the primary antibody. Unlabelled sample (blue line) was also used as a control. This antibody gave a positive signal in T47D cells fixed with 80% methanol (5 min)/permeabilized with 0.1% PBS-Tween for 20 min used under the same conditions. ab185048 has not yet been referenced specifically in any publications. Publishing research using ab185048? Please let us know so that we can cite the reference in this datasheet.